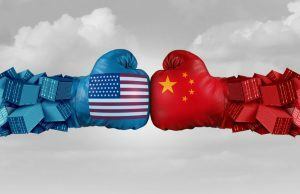 Market sentiment has taken a renewed hit overnight as President Trump appeared to rule out a meeting with Chinese President Xi before the 1st March deadline for negotiations. Whilst this does not mean that all is lost, it shows how much work is still to be done. Effectively Trump needs his key advisors (such as Mnuchin and Lighthizer) to put in the hard yards before Trump signs any agreement. It would appear that not enough progress has been made to allow Trump to have his ceremonial moment quite yet. The US will see the economic slowdown in China and the position that China will be in needing an agreement, so they will not want to give too much too soon. What is does mean is that agreement is less likely now before the end of the deadline and how the US responds to this will be key in the coming weeks. Tariffs are due to ramp up after the deadline and markets will certainly get jittery again if after all the rhetoric of positivity and progress in recent weeks which have helped to improve sentiment, turns sour. For now, sentiment has taken a hit. Treasury yields are lower, Wall Street markets have dropped by around a percent, the oil rally has dissipated and the safe haven assets (yen, Swissy, gold and the dollar) are being supported. Wall Street fell last night but did close off the lows of the session, with the S&P 500 -0.9% at 2706. US futures are -0.4% early today which has also done for the Nikkei in Asia which has fallen by -2.0%. In Europe, there is a more settled look to FTSE futures (-0.2%) and DAX futures (-0.4%) mildly lower. In forex, there is a lack of direction as the European session takes over, with limited moves on the G4 majors. Mild sterling underperformance whilst the yen is again edging higher. Of the commodities majors, the Aussie is a shade lower but the Kiwi a shade higher. In commodities, there has been some support for gold but this is just dropping away again slightly, whilst oil has continued yesterday’s decline and is a further half a percent lower. Once more there is a very light economic calendar today, with the backlog of US data clogging up ever more into subsequent weeks. The only thing to really keep an eye on is Canadian unemployment at 1330GMT which is expected to tick higher to 5.7%in January (from 5.6% in December). The selling pressure through the DAX yesterday, along with the breach of the S&P 500 uptrend, made me consider what is going on with the Nikkei (I very rarely talk about the Nikkei due to session timings). Questions have been raised over the viability of the continuation of the January rally and the sell signals are beginning to filter through. The Nikkei is another index that is showing signs of wobbling and this is coming at a dangerous time on medium term technical indicators. The January rally unwound the market back to the resistance around 21,000 of the old Q4 2018 lows, but this is an area of overhead supply and resistance. With seven negative candlesticks (takes as a close below the open) in the past eight sessions there is a deterioration in momentum. The RSI is back at 5 week lows back below 50 is a concern, whilst the MACD lines have simply unwound back to neutral and are looking set to bear cross lower. A sharp deterioration in the Stochastics, along with a negative divergence (albeit only a mild one) with the recent high at 20,981 along with a bear cross suggests a loss of upside momentum now. Today’s session has broken the support of the higher low at 20,408 as a key gauge which points towards the formation of a new negative trend. A breach of the next support at 20,102 would re-open the lows at 18.950. 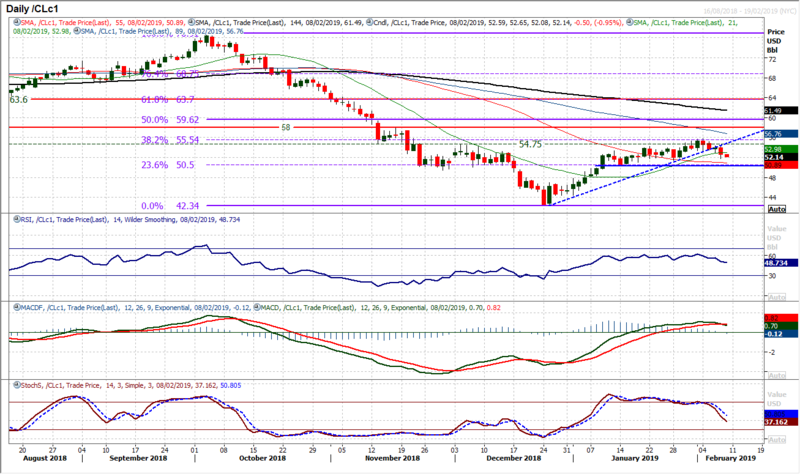 The euro remains under corrective pressure as another negative candle formed yesterday. This is now the fourth in a row, but now we see EUR/USD coming back towards the basis of support around $1.1300 it is interesting to see the selling pressure just beginning to ease slightly. Time and again over the past three and a half months, EUR/USD has found buyers willing to support the market around $1.1300. Momentum indicators maybe near term corrective but there is a suggestion that this is again just a near term dip within the medium term range. 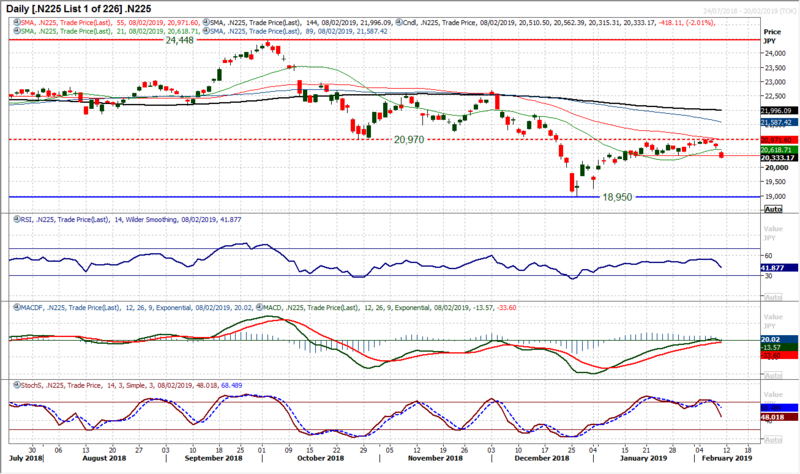 The RSI is still above 40 and MACD lines are only marginally lower. The hourly chart shows the hourly RSI struggling to overcome 50, but the bulls will now be looking for their timing to re-enter once more. 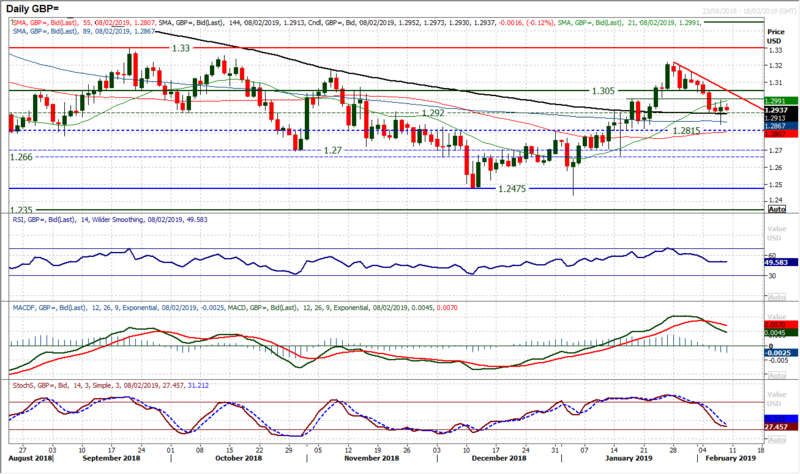 There is initial resistance at $1.1375 which would be a signal if breached. Initial support at yesterday’s low of $1.1320. The immediate selling pressure on Cable seems to have dissipated slightly. A broad daily range of 140 pips (Average True Range is currently 100 pips) resulted in a minor positive close despite the Bank of England sharp downgrade to growth expectations. 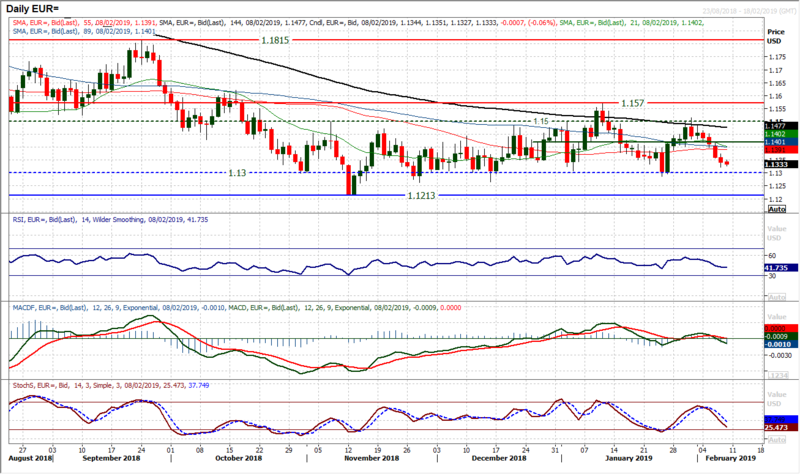 The low at $1.2850 will now help to form support and comes just above the $1.2815 pivot support. 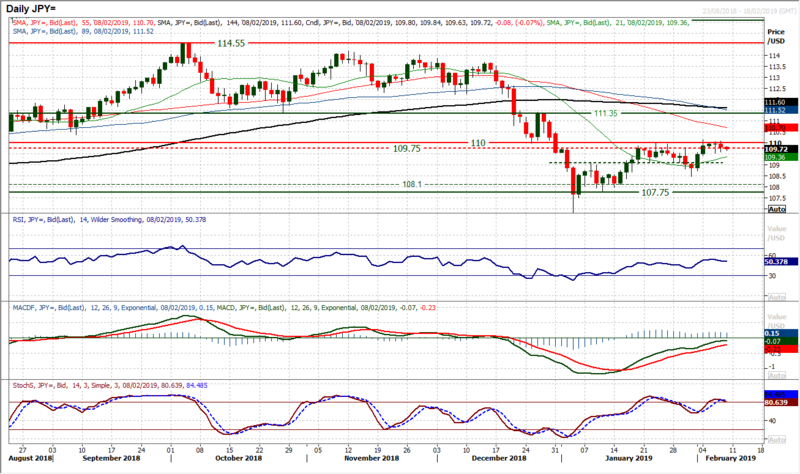 Momentum indicators look to be stabilising now with the RSI around 50 and fall on the Stochastics also decelerating. However, there is still resistance around $1.3000 as the psychological level and also old near term pivot. It does seem as though the corrective move of the past week has been just a drag back into the belly of the medium term range. There is a clutch of pivots between $1.2800/$1.3000 and this could be where we begin to see Cable gravitating around. We have been talking about the resistance around 110.00 for much of this week, but once more yesterday this was a level that the bulls have struggled with. Backing away from 110.00 with a negative candle will become a concern if this is added to by another negative move today. There are now mixed signals coming with the momentum indicators, with the Stochastics rolling over again. The last time the Stochastics rolled over above 80 whilst 110.00 was the resistance was in late January when the market began to slide back again. This is a market increasingly unsure and ranging again. The hourly chart shows the tight range between 109.55/110.00 with the momentum indicators tight (hourly RSI between 40/60, hourly MACD lines around neutral). The next decisive move above 110.00 or below 109.55 will likely prove to be directional. Above 110.00 (on a confirmation above 110.15) opens 111.35. Below 109.55 opens 109.10. Gold continues along its near term corrective path as the run of lower daily highs in the past five sessions has dragged the price back into the $1300/$1310 support band. For now this long term pivot is holding but given the near term corrective configuration on daily momentum indicators, there could still be further downside to run. The support of the 12 week uptrend comes in at $1293.50 today. However, yesterday’s small positive candle will give the bulls belief in the pivot $1300/$1310 being supportive. They will now be on the lookout for renewed positive signals to give a chance to buy. Weakness in gold is a buying opportunity and this current move lower is counter to the uptrend. Pullbacks in bull market corrections tend to undershoot their corrective targets before the buyers move back in. The bulls will be looking for a near term move to be held back above $1308.50 initially, but also need the minor pivot at $1316 to be breached. The hourly chart suggests that the time is not quite right yet, but a decisive push above 60 on hourly RSI and above neutral on hourly MACD lines would certainly add a more positive complexion. 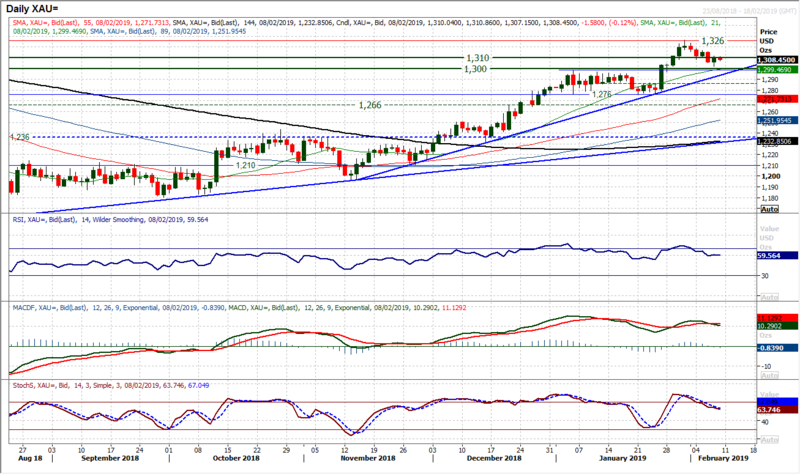 Initial support at $1302 is above the $1300 long term pivot and the $1298 breakout support. The uptrend dating back to late December has now been decisively broken and the bull argument is looking increasingly sketchy. The deterioration in momentum indicators is becoming an increasing concern, with the acceleration lower on Stochastics, whilst the MACD lines are on the brink of a bear cross. The hourly chart shows the near term deterioration with a run of lower highs in the past few days, whilst hourly momentum is correctively configured (hourly RSI failing at 60 and dropping back to 30, with the hourly MACD lines failing at neutral). The support band $53.00/$53.00 being decisively breached now at least opens a test of the higher reaction low at $51.30. In essence, the bulls could stomach a drop back to the 23.6% Fib level at $50.50 and the key support at $50.40, but the positive outlook would be under serious pressure below there. The resistance is increasingly important at $55.75 now, whilst a decisive rebound above $54.30 would help to improve the near term outlook. The old near term support $53.0/$53.30 is now a basis of near term overhead supply. The Dow closed lower by around -0.9% last night as the recent bull move felt some retracement. The question is now one of whether this is a blip in the bull run, or the beginning of a correction. So far the momentum indicators are not overly concerning. There is a drop back on the RSI to the low 60s with the Stochastics only marginally losing their upside momentum. It was interesting to see the intraday low at 25,000 which was a previous basis of resistance and subsequently yesterday acting as support. 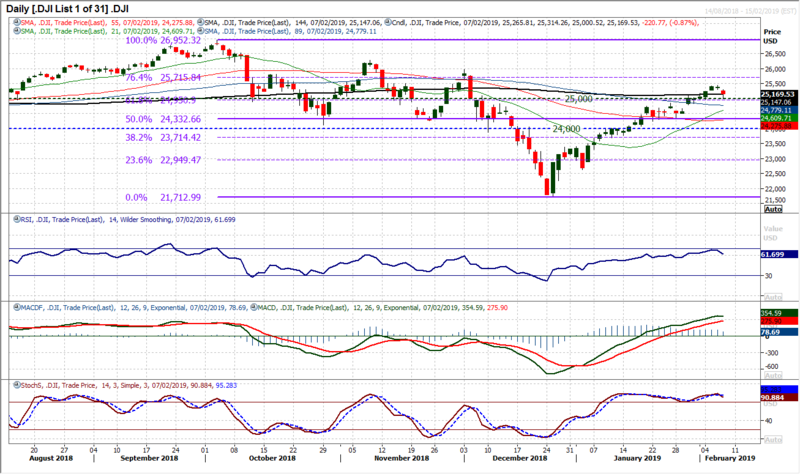 The 61.8% Fibonacci retracement at 24,950 is also a consolidation point for the bulls. If these levels are breached by another negative candle today then there would be concern growing for a retracement back towards 50% Fib at 24,333. Resistance is now at 25,439.